SJ Wolfe Racing followed up their massive Albany treble last Friday with a winning double at today's Mt Barker meeting. 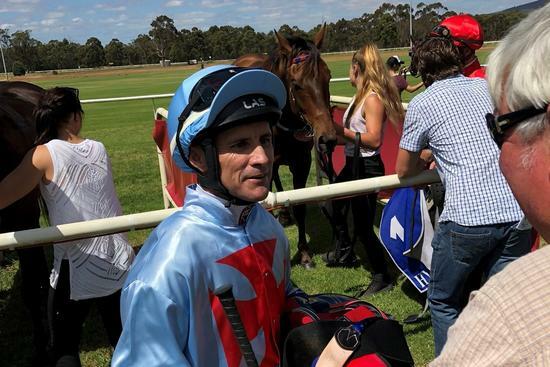 Long-time top city jock Shaun O'Donnell (pictured) deputised for stable riders Shaun McGruddy, Peter Hall and Peter Knuckey, and produced two flawless displays to pilot Kostyazilch and Gauged to victory for Team Wolfe, while also saluting on Perazzi for trainer Bob Bell to make it a winning treble in the saddle. The ever-consistent Kostyazilch started off the day in the best possible fashion with a well-deserved victory in the George Toovey Handicap (Race 1-1850m), tracking $1.30 favourite Time To Hunt throughout before working past the odds-on pop late to win well. The six-year-old had been building towards a peak performance and the way he got the job done suggests there's a few more wins in store for him in 2017/18. The in-form Gauged bookended the Mt Barker program for the 'Wolfe Gang', with O'Donnell sublime in saving ground in transit and producing him with a well-timed winning move to claim the Kevin Forbes Handicap (Race 7-1300m). The five-year-old has hit career-best form this campaign, with two wins from three starts, and looks on track to start fulfilling his ample potential.